Sustainability is among our most pressing challenges and a report in September from the Intergovernmental Panel on Climate Change (IPCC) indicates scientists are now 95% certain that humanity is responsible for climate change. Today we consume 26 times more than we did 150 years ago and the idea of perpetual economic growth is an unsustainable trajectory, so business must rethink fundamental questions. Climate change brings risks, but also opportunities for organisations to take the lead in finding solutions. CSR reports are full of data, but it is still a great challenge to engage the consumer in this debate. A report from the World Economic Forum in 2012 found that only 28% of people understand what terms such as ‘sustainable’, ‘responsible’ and ‘green’ really mean. Currently, only one in five brands globally is perceived as making a meaningful difference to people’s lives – they aren’t looking for utopia, but do want a better future. The challenge for all business leaders, therefore, is to develop an engaging sustainability narrative that resonates with people’s values in a 21st-century context. But this will require a whole new mindset. The first poll question posed to the 250 business leaders attending the EY risk conference in Stockholm was: ‘How will business performance be measured by 2020?’ 34% said profit, whereas 54% agreed that it will be measured by the 4Ps: People, Planet, Purpose and then Profit. I strongly advocate the ‘4P’ Business Model because once we have a positive impact on people and planet – with a purposeful ethos to match – we guarantee a place for our organisation in the future. To develop a ‘4P’ approach and navigate into the future, assessing both risks and opportunities, requires Multidimensional Thinking – in which we combine ‘Left Brain’ preference for rationality and hard facts with ‘Right Brain’ creativity and intuition. Such an approach enables us to collate and analyse trends and also implement positive change. To our second poll question: ‘Are you a left or a right brain thinker? 53% answered: ‘I mostly use both Left and Right thinking’ and, as expected at a risk conference, almost a third said that they see themselves as factual, logical and pragmatic left brain thinkers. Our Trend Atlas 2030+ reveals challenges and opportunities in both a global and local context, with a shortlist of key sustainability trends to watch. It’s important to note that all are interconnected and emphasise the overriding driver of purpose-driven leadership. 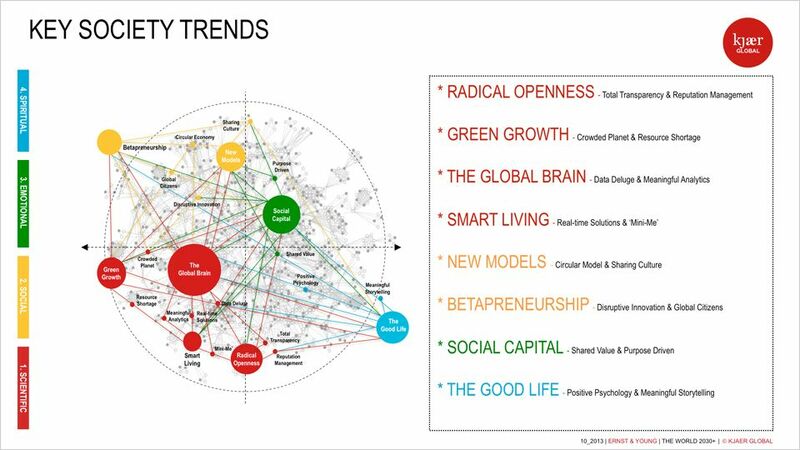 The first trend Radical Openness is a given in an era of Total Transparency. Businesses simply must work harder not only to be noticed, but also to be trusted as the digital economy evolves. Building bridges not walls is the key to reputation management and the challenge ahead is to unlock the components of a truly ethical brand. The number of companies that profited from sustainability initiatives climbed from 23% to 37% in 2012, meaning Green Growth is a key future opportunity in an era of overpopulation and resource shortages. Our third poll question: ‘How many sustainability initiatives did you engage with in 2012-2013?’revealed that 69% have been involved with 1 or more initiatives over the last 18 months, whereas 31% have not engaged in any at all. Leadership in renewable energy is coming from Scandinavia, alongside Asia’s Green Mega Cities – both demonstrating how innovation and collaboration are key components for positive change. The Global Brain or the Internet of Things (IoT) is now a reality and Big Data intelligence is bringing huge opportunities for green growth. It’s estimated that 50 billion devices could be connected to the IoT by 2020, helping to facilitate both a new understanding of our living environments and solutions to society-wide problems. 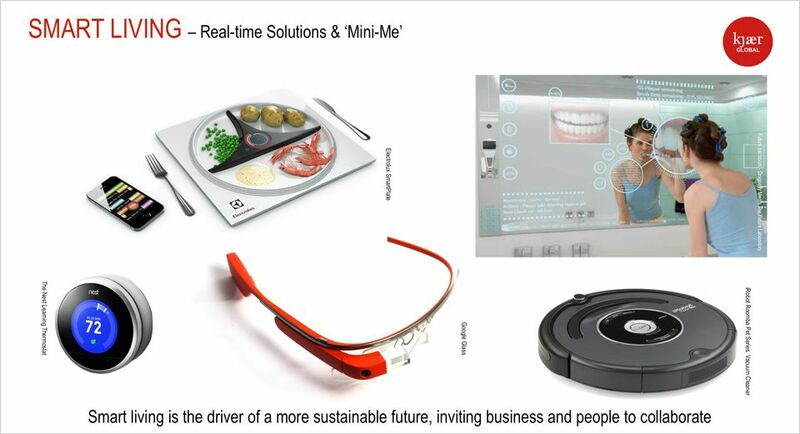 Smart Living will also be a driver of a more sustainable future, inviting business and people to collaborate on everything from digital health monitoring and real-time consumer electronics to risk management. One of the key opportunities is in New Models for business – particularly the Circular Economy, a vision to optimise use of materials and reduce waste by building reuse/renewal into the manufacturing process. Research shows potential material cost-savings of up to $380bn annually in the EU if circular models were adopted. Our fourth poll was: ‘Will a ‘circular economy’ take sustainability to the next level?’ 57% of the audience said: ‘Yes, recycling, reusing and sharing is key to a sustainable future’ – however 38% responded that enabling polices are required to make this happen. This Circular Economy also ties in with the new sharing economy, already a reality in South Korea where 60% smartphone ownership is enabling sharing of resources such as transport and buildings. 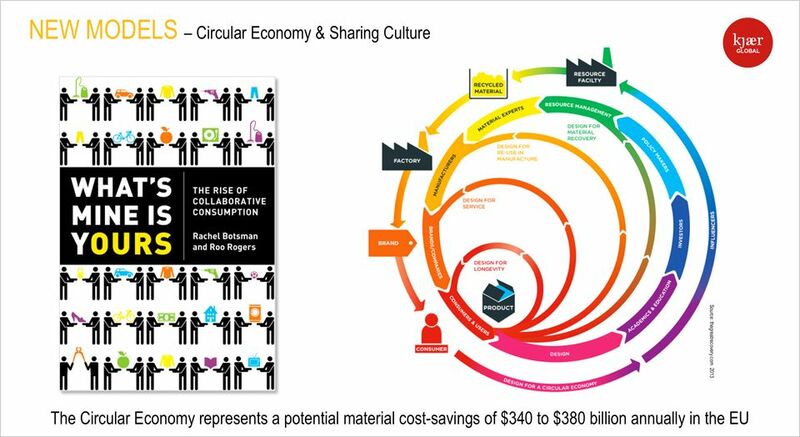 Sharing and Collaborative Consumption is essential to sustainability, productivity, innovation as well as a competitive advantage and it also brings empowerment to people and communities. Championed particularly by Global Citizens and Millennials, it drives the entrepreneurship essential for autonomy, as well as the welfare state, jobs and innovation. In this context, Betapreneurship is the way to promote a creative culture of being proactive and disrupting existing business models – examples include Google’s 20% policy that invites key employees to innovate on one day a week to stay ahead. Social Capital is not just the sum of the institutions that underpin a society, but the glue that holds them together, and people are seeking shared values. 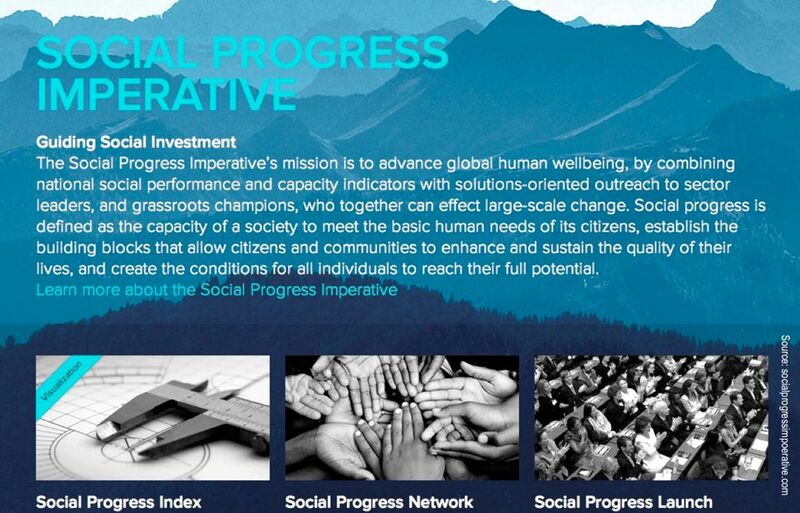 Initiatives such as Michael Porter’s Social Progress Index (currently topped by Sweden) are new measures of how governments and businesses must recognise their role in ensuring responsible capitalism. As the definition of The Good Life goes public, we are starting to question conventional measures of success. Harvard Business School’s course on ‘Happinomics’ is oversubscribed and already informing future generations of business leaders, so it seems certain that a ‘Good Life Index’ will be a reality one day. Gallup’s wellbeing world poll is now in its seventh year and rates conditions in 150 countries. Key tools to measure wellbeing include its Job Climate Index, shown to correlate with thriving economies. There was a positive response to our final poll question: ‘Will governments adopt a ‘gross national wellbeing’ index by 2030?’ Only 19% said ‘not at all’ and the remaining 81% agreed that it is a possibility, including 37% who stated: ‘absolutely’, a wellbeing index will happen. 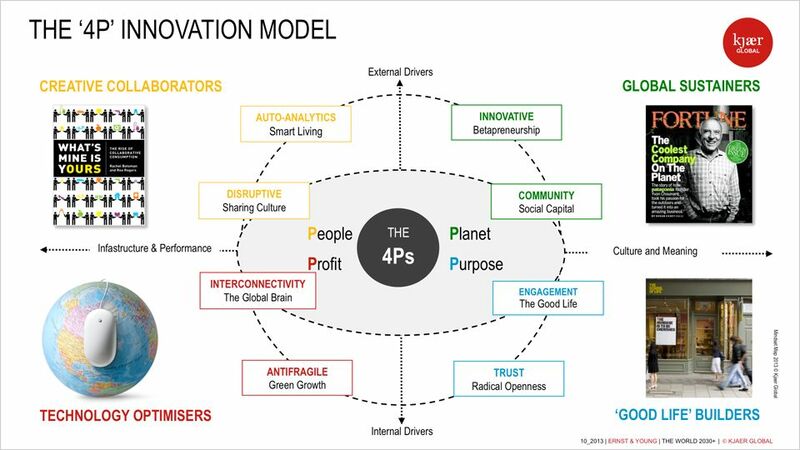 Adopting the ‘4P Business Model’ means we need to redefine what success looks like. Clearly, Purpose is the social fabric that interlinks all trends and will enable positive business growth in the future. Purpose-driven change makers engage with their community to drive disruptive innovation and the sustainability agenda. Remember, brilliant business models are never anonymous, demonstrating global impact while reaching out to local communities. 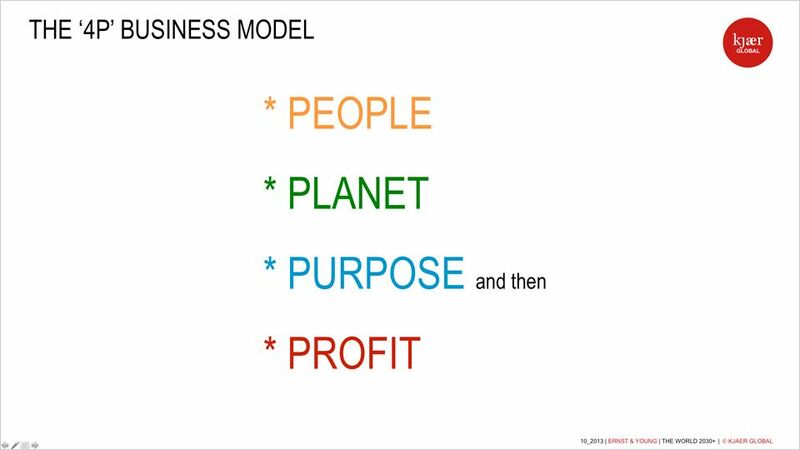 There is growing evidence that business and society can thrive on alternative models, so successful organisations will make sustainability a key priority by adopting the ‘4Ps’ to deliver tangible social, emotional, ethical and economic value in one package.